It was universally agreed that Ted Cannon was destined for great things. Born at Ballarat on 30 July 1895, Ted was the only son of Edwin and Florence Cannon. From an early age young Ted showed remarkable artistic promise and he possessed 'more than average ability.' It was a natural step for him to attend the highly regarded Technical Art School (part of the Ballarat School of Mines [SMB] campus) in 1912, where he came under the influence of principal and artist H. H. Smith. A fellow student and friend was Amalie Feild (later Colquhoun). Precociously intelligent, he always seemed a step ahead in everything he did. Ted was devoted to his art, and devoured all areas of a full course of study. He quickly became one of the most popular students at the SMB Art School, and loved spending time with the younger students, who greatly admired him. He developed a sharp intelligence and a keen sense of humour, his cheerfulness in the face of any eventualities was perpetual. Whilst Ted displayed a talent for industrial design, it was his black and white work that 'drew' most attention. His cartoons and caricatures, heavily influenced by Phil May, were of a particularly high standard. During the Ballarat Exhibition of 1913 Ted's work was singled out for notice and he was awarded First Prize. After completing his art course Ted was employed as an assistant teacher at the Art School, before taking a position as cartoonist with the Ballarat Star newspaper at the end of 1914. With the war raging in Europe Ted discovered a darker aspect for his artwork, but, still, he could not resist depicting Turkey as a full-feathered, fez-wearing bird. In 1915 Ted was awarded the prestigious Victorian Education Department Senior Technical School Scholarship. Only months into his scholarship, Ted volunteered for the AIF. A keen member of the local 71st "City of Ballarat" Regiment Ted was already primed for a life in the army. He embarked from Port Melbourne on 23 November 1915 with reinforcements to the 6th Infantry Battalion bound for Egypt. Back in Ballarat the public was entertained by Ted's letters, which were published regularly in the Ballarat Courier. Ted wrote in a breezy manner, but it did not require great imagination to discover darkness beneath the surface of his frivolity. Living on 'salty bully beef and dirty creek water' in barely adequate clothing that was infested with all manner of vermin and surviving intense bombardments that cost him 'a good few pals' made him think longingly of the comfort of home. Generally, however, he was undaunted and, invariably, parcels of drawings accompanied his letters. It was during the Battle of Pozieres on the Western Front that Ted Cannon came into his own. His work with the Scout Platoon (under the command of Lieutenant Jack Rogers) sketching the enemy's gun emplacements proved invaluable to the Brigade and brought Ted to the attention of the Australian High Command. Ted wrote: "Did I tell you in the lost letter that I was a scout? If I didn't do so then I do so now. It's a good game too. Just suits me right down to the ground. All through our tour of duty in the trenches I have had a sort of roving commission observing the enemy's doings, etc, from the tops of trees, battered buildings, and all sorts of funny places. It's a bit awkward at times if a sniper gets on you when you're about 30 or 40 feet above the ground in a tree - you often 'miss the step' on the way down so hastily. If you happen to have left your telescope or your compass up top in the excitement, it further complicates matters. I got in that fix the other day. Hurried down and left my compass behind. I sat down behind the tree and viewed the surroundings for about half an hour, and then made at least three attempts to get up, but before I'd get near half-way the sniper would spot me and put up a quick-firing record. I beat him in the end, though, by sitting behind the tree and writing a few letters. By the time I had finished writing he'd 'chucked it up' as a bad job and turned his attentions elsewhere... Very often, when I am dangling by my eyebrows from the limb of a high tree, trying my best to draw with one eye to the telescope and the other one on the pad, I wish I were back home again drawing bulrushes and willow trees from the banks of the Lake [Wendouree]. Some of the sketches I do here wouldn't pass muster with Mr Smith I'm sure. In places my line gets jerky and dissipated looking. This is due to a sudden cold sensation shooting through my anatomy as a bullet whistles through the tree or a shell bursts in the vicinity. The 'message of death' that had whistled so willingly around Ted Cannon finally found its mark. On 13 September 1916 he was given a special assignment for General C. B. B. White. Ted was sent out forward of the Old Mill at Verbranden Molen (in the Ypres Salient) to draw a panorama of the German lines in the area from Hill 60 to The Bluff. It was a hazardous task and Ted was warned to be careful. Tragically he was sniped by an enemy machine-gunner and sustained severe abdominal wounds. Stretcher-bearers rushed him to the 17th Casualty Clearing Station where he was operated on by the doctors at 8.30 that night. With little chance of success, but ever resilient, Ted remained conscious almost to the end. He died early in the morning of the 14 September 1916. His body was buried in the large Military Cemetery at Lijssenthoek. As a mark of respect to the popular young artist, Lieutenant Jack Rogers had the Scouts erect a new Observation Post in the Glide on the summit of The Bluff, which was to be marked on all maps as "Cannon's Post." 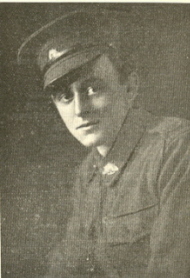 Image caption (Top RHS)- Lance-Corporal E.J. Cannon, c1915. Image caption (LHS)- Sketch by E.J. 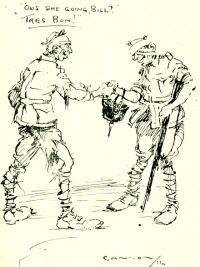 Cannon, depicting himself and mate after raiding German trenches at Pozieres, France. Published in the SMB Students Magazine, 1916. Image caption (Top RHS)- Sketches from The Front, by E.J. Cannon. Published in the SMB Students Magazine, 1916.